I’m a sinner, I like it that way. 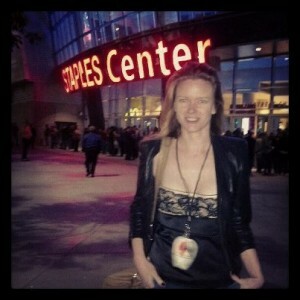 I saw Madonna in concert the other night at the Staples Center in downtown LA. At one point she did a strip tease for the audience and presented us with her elegantly sculpted backside. Malala Yousafzai, the 14 year old girl in Pakistan who spoke out for the female right to an education. A representative of the Taliban stopped her school bus and got onboard. He asked for Malala. He singled her out from the other children. He shot her three times in the head and neck. She was so dangerous that they felt they had to kill her. I wish I could go back through my childhood and adolescence and erase every grumble, every whine, every complaint I ever made about homework, or deadlines, or getting up early to spend my day in summer school. What I didn’t understand at the time was that I was doing something sacred: I was getting educated. 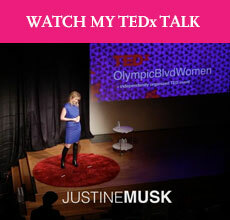 I am a mother, and I was a wife, but I also get to lay claim to an identity that both enfolds and goes beyond that: my personhood, my me-ness, my place in the world as Justine Musk. My place in the world as a woman. I can pursue my dreams knowing I don’t risk my life to do so. Chances are, so can you. As women, we eye ambition with distrust, we equate it with the advancement of self at the cost of those we care for, the relationships we nurture and support. To take time to do creative work, pursue mastery, fulfill a dream, chase self-actualization as a person and not just as wife and mother – so often all of that gets dumped at the wayside – selfish, selfish, selfish. As bright and educated as we may be, it’s still the role of the woman to support the dreams of the man, not so much vice versa. If you had the cure for cancer, would you keep it to yourself, or would you share it with the world? Wouldn’t you feel obligated to share it? Wouldn’t you feel – even if you’re not religious – that you had a sacred obligation to do so? Your dharma involves identifying and cultivating your natural talents. It involves the pursuit of mastery, of deep and focused attention on one thing; in coming to know, truly know, that thing. For in penetrating the essential nature of it, you come to know the world. It also involves locating that place where your gifts intersect with the times so that the world might benefit. Because your talents don’t belong to you. They belong in service of the world. You are merely the steward, to activate those gifts and provide them in whatever way the times call them forth. In other words, it is selfish to keep your gifts to yourself: unknown, undeveloped, buried inside you. Your gift might not cure cancer, but somewhere, in some way, it eases a pain, or solves a problem, or brings light to darkness, or cracks open a false self, or exposes a lie, or generates hope. What if the dream you harbor inside of yourself as some kind of selfish dirty ambition…was actually your sacred obligation, not to yourself but to the world? This is how we change the world: not by turning inward to self and family, disconnecting from the larger picture to chase perfections that probably aren’t possible anyway, thinking that everything is our responsibility, our fault, up to us alone, rugged individuals that we are. As we keep our voices and our stories and our selves – to ourselves. Meanwhile the world gets crazier everyday. It also gets smaller, bringing that craziness closer and closer to our own backyards – if you haven’t found it there already. What if it’s time to look up and outward, to reach out to other, to take seriously this idea of global sisterhood instead of rolling our eyes at it? What if it’s our sacred obligation to put our gifts to use in the world, to turn ourselves into dharma warriors, to recognize the right that every female has to an education, a dream, an identity of her goddamn own? That’s not crazy. That’s not selfish. That’s not entitled. — and do it in the name of God. Take the time – make the time – to pursue your dream today, even if it’s just for fifteen minutes, even if it’s just one small action, even (or especially) if your dream is to come up with a dream that is truly of you and for you and belonging to you. Do it for Malala. Because she can’t. I am in tears. Thank you for this. What a beautiful article. You are a great writer Justine. You can add Vote! We American women can. Billions of people, many more than half of them women, can’t vote. I’d prefer you vote for MY candidate – and no I won’t tell you who he is – but if you are an American woman, you CAN vote. If this is your first election, Vote! Even if you think it isn’t necessary in your state because the outcome is already predetermine. Because studies show that kids who start voting once they are old enough keep voting the rest of their lives. If you can’t go to Africa and help in person, support the people who do. If you have no money, write your Congressperson instead. IOW words, I agree: the world is full of problems – but it is also full of potential problem-solvers. Be one. Praying for that little girl – for that is what a 14 yo is. PS Kudos to Madonna – for finding a new spot for a creative ad. We each have to find our way to bravery. It is through the stand of courage that we know ourselves and extend the circle for others. It is not always easy and certainly riskier for some than others yet it is crucial to our continued evolution. Thank you for this eloquent article. This is profound and has changed the way I think. Thank you, Justine. “Never forget your dreams — they are your personal myths. Strive to be as a child. The universe is yours with which to explore, to learn, to grow. Children are the greatest dreamers of all, seeing the universe as a vast playground where everything is clear and everything is possible. Children yearn for everything that they would like to see happen in their lives. Your most important obligation as an adult is to follow your dreams. Your happiness will leak into your local environment, which will leak into the larger environment, and then into the larger-still environment and so on. The soul of the world is nourished by people’s happiness. Goosebumps. Thank you , Justine. Girl powers ACTIVATE! You’ve just made me feel like I can do this. I can make a difference. And I owe it to the world (not just to myself) to do it. I’ll find the 15 minutes today. And tomorrow. And the next day. For me, and for all of us. Thank you, Justine! Thank you so much for articulating what I so wish I’d been able to read when I was 14. (Or 24 or 34 or even 44.) Sometimes what is emerging as my dharma seems so trivial to me. Unimportant. Not worth the struggle it takes to bring forth. I forget that I’m just one small piece of a mosaic. Think what a work of art this world would be if every woman believed it was a sacred duty to become what she yearns to be. A perfect and powerful message at the right time. You’re always saying the right thing at the right time. Your writing is like medicine women need. This is something that will stick in my soul as I continue working with young women here in the South. Thank you for the continued motivation and the fuel to keep it going. Brilliant. What a beautiful reflection of Spirit, Soul & Heart. Thanks for the reminder. For ALL of us. Is sisterhood like brotherhood in a skirt? Seems you’re still a bit pissed at men to me but then I am your inferior no?